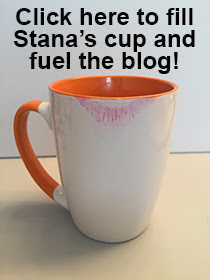 So, Stana, I send you this photo. Actor Trent Dawson femulates on television’s As the World Turns (2009). Zoé, you chose this photo because of the flowers, but what it would be without you. I like the interesting contrast between the colorful bunch and your nice black minidress and white boots. Really good. Tu es une très belle femme, je trouve. You are a very beautiful woman. Another good photo in the "my favourite photo (of me!)" series. Well done, Zoe. Stana, I think it would be nice to have a gallery of these on the website. Would that be difficult to set up? I will put it on my to-do list, Michelle.